Mushrooms make good sense for us homesteaders. They make good sense for someone who just dreams of being a homesteader. It doesn’t matter if you live in an urban or rural area; you can reap the benefits from growing mushrooms in a personal garden or on a commercial farm. They can even can be produced in- or outdoors. Mushrooms will improve your health, your soil, and your finances. Best of all, growing mushrooms is not as mysterious or difficult as you may believe. Both shiitake and oyster mushrooms have a myriad of health benefits. They each contain a high level of B vitamins which are essential for converting food into energy and keeping the nervous system healthy. Oyster mushrooms have five times the amount of vitamin B3 as found in other vegetables. Both varieties have the compound ergothioneine. This compound protects cells and builds immunity. Mushrooms are natural antioxidants, deactivating and removing cancer-causing radicals. Mushrooms are also anti-inflammatory, easing arthritis pain and inflammation caused by most chronic illnesses, especially autoimmune diseases. Shiitake mushrooms provide 65% of our daily recommended value of copper. Our bodies do not produce copper naturally so we must get it in our diets. Shiitakes also have the compounds pantothenic acid and selenium. These compounds discourage inflammation and fight harmful bacteria and viruses. Selenium stimulates the immune system, important for people with conditions that weaken the immune system making them susceptible to infections that occur when the immune system is compromised. The high level of potassium in oyster mushrooms acts as a preventative for heart disease and hypertension. Oyster mushrooms have a higher iron content than red meat, making them an excellent choice for people prone to anemia. Both oyster mushrooms and shiitake mushrooms provide us with vitamin D, important for strengthening bones, as well as improving and stabilizing moods. Not only do mushrooms improve your health, they improve and maintain the health of your soil. Plants rely on the fungi and bacteria in soil to digest nutrients for them. 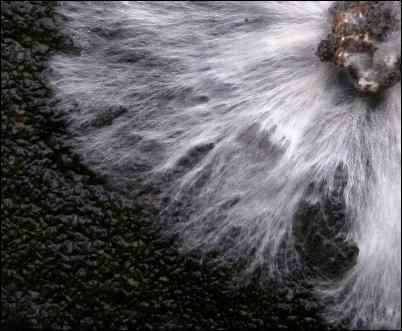 Oregon State University Extension Service explains how hyphae, the threadlike networks below the mushrooms, attach to plant roots and create filaments that reach deep into the soil. Hyphae can increase the surface area of plant roots up to a thousand times. This is great news for any land, but especially good for land that has experienced topsoil erosion. Now that you know the benefits of growing mushrooms, we can talk about how to grow them. There are several different ways to grow mushrooms, but I am going to focus on growing them on cardboard. Cardboard is cheap, easy to findand it retains moisture well, while the corrugations allow for good air flow. Growing mushrooms on cardboard is accessible to anyone and you can grow a lot of spawn with a little work. First, you need to make a spore print. 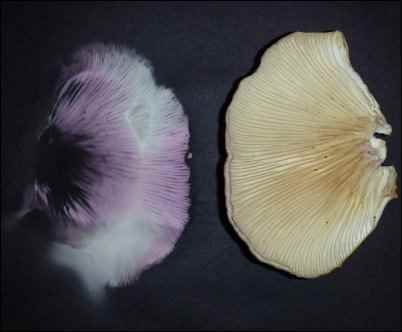 Lay mushroom slices on a piece of construction paper and let sit until you can see the white spores outlining your mushroom pieces. Sterilize your growing medium. There are a variety of mediums you can use, but the two that have worked the best for me are freshly used (still warm) coffee grounds or cooked and cooled brown rice. Layer pieces of your spore print and your growing medium in a glass jar. Cover and let incubate in a warm (70-75 degree) area for three to five weeks. You will be able to see white filaments spreading throughout your medium. Now that they are colonized, expand the mass by ten with fresh growing medium. Soak your cardboard in a tub of warm water for one hour. While your cardboard is soaking, drill drainage holes in the bottom and around the sides of a sterile five-gallon bucket. Drain as much of the excess water from the cardboard and tear it into pieces that will easily fit into your bucket. Line the bottom of the bucket with a layer of cardboard and sprinkle with your mushroom spawn. Continue layering for up to two feet. When I first did this, I felt like I did not have enough spawn. I wanted to have equal layers of cardboard and spawn, but I found that that is not necessary. All you need is enough inoculated spawn to sprinkle on each layer of cardboard. When you have finished layering your bucket, gently compress the layers with your hand. It should not be packed tight but everything should be touching. Cover the bucket with a plastic bag to maintain higher humidity. Remove the bag to let the mycelium (vegetative part of a fungus) receive oxygen for at least 30 minutes a day and up to one hour. When the bag is removed, check to ensure the cardboard has not dried out. If it is dry, water it. Once your mushrooms begin to grow you can decide to allow them to continue to grow on the cardboard just as they are or you can introduce pieces of the cardboard into bags of pasteurized straw. 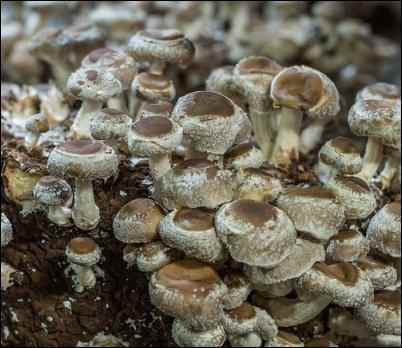 Of course you will also want to continue the process of producing mushrooms by using some of your inoculated cardboard pieces to make more spawn. Simply sandwich some of the inoculated sheets between new, freshly prepared cardboard pieces. There are a few things you should know if you choose to grow your mushrooms on straw. First, you need to pasteurize, not sterilize, the straw. Sterilization is done at temperatures high enough to kill all living organisms in your substrate. Pasteurization is done within a temperature range to reduce harmful bacteria while keeping some of the beneficial bacteria alive. Enough of the harmful bacteria is eliminated to give the mycelium a fighting chance. Pasteurization occurs between 160 and 180 degrees Fahrenheit. You should use cereal straws, such as oat or wheat, rather than hay. It is helpful to use straw that has been cut to 1”-4” in length but this is not absolutely necessary. Fill a large, heavy pot half full with water and bring to a boil. Once boiling, reduce and continue adjusting heat level until a thermometer stays within the range of 160-170 degree Fahrenheit. Put your straw into a nylon-mesh bag. It is important that all the straw be pasteurized, so only use as much straw as can be submerged in your pot of water. Put the bag of straw into your pot and weigh it down with a brick or other heavy object in order to keep it submerged. Remain diligent regarding the water level and temperature as you let it sit for one hour. Remove the bag and put in a strainer. Take any necessary precautions to protect yourself—the straw is very hot at this point. Allow the bag to drain and cool to room temperature. Use immediately. Once you have mushrooms growing, the next question is about proper harvesting. Oyster mushrooms should be harvested as soon as they bloom, especially if you are growing them outdoors, as they are susceptible to insect infestation. The insects present no health risk, they just make cleaning, drying, and storing the mushrooms more difficult. Cut oyster mushrooms at the base of the stem and collect in paper—never plastic—bags. Refrigerate until you are ready to eat them or process them for longterm storage. Shiitake mushrooms should be harvested when the gills are slightly exposed but the cap edges are still curled under. Pull and gently twist the stem. Place in paper bags and store in the refrigerator as you would the oyster mushrooms. Like other produce, mushrooms taste best when they are fresh. They are still tasty, however, and provide the same health benefits when they are dried. The main benefit of drying mushrooms is that drying increases their shelf life for six months to one year. The process of drying mushrooms is much like drying other products and will yield approximately one pound of dried mushrooms per seven pounds of fresh mushrooms. Before you dry your mushrooms you need to clean them. I have found a soft, dry watercolor paintbrush to be the most effective tool for removing dirt or insects. Next, cut each mushroom into strips, using the gills as a general guide. Place mushroom strips on a roasting tray in the oven on a low temperature and roast several hours until dry. If you are going to use a radiator or woodstove I recommend placing a wire rack on the roasting tray and your mushrooms on top of the wire rack. This will help you avoid crisping the edges and underside of your mushrooms when you do not have as much control over your heat source. Once the mushrooms have completely cooled, place in a glass jar and leave uncovered overnight. This ensures mushrooms are thoroughly dried and will not mold in your containers. To use, simply rehydrate in hot water for ten minutes. Fresh mushrooms are delicious sautéed in a little butter with salt to taste. Mushrooms, fresh or re-hydrated, can be added to almost any savory dish. Try them in stews, pasta sauces, meatloaf, and chicken dishes. You can even make and use your own powdered mushrooms to add a nutritional boost to anything, or to sprinkle on meats like steaks and hamburgers. Oyster mushrooms, as their name suggests, have a slight oyster flavor and taste great paired with seafood, or used as a seafood substitute. A practical way to enjoy the health benefits of mushrooms every day is to use them in a tea. Pair the mushrooms with a complementary herb and your preferred sweetener for a wonderful drink to sip any time of the day. Rosemary is a nice herb for a mushroom tea. Surprisingly, mint also makes a delicious mushroom accompaniment. Exotic mushrooms are enjoying a renewed interest from foodies and the health conscious everywhere. Oyster mushrooms are priced around six dollars a pound and shiitake mushrooms are are even costlier. It makes sense to let your mushrooms improve your financial, as well as your physical, health. Markets are opening up as more people are exposed to exotic varieties. 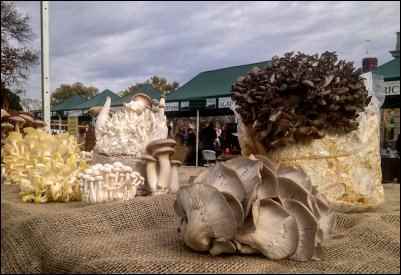 The easiest place to begin selling your mushrooms is your local farmers market. A farmers market is based on supply rather than demand and the people who shop there are interested in fresh, healthy, and unusual foods. To draw more interest, take one of your containers of growing mushrooms. This living prop is an interesting draw and talking point for potential customers. Be prepared to hand out free samples and have a few simple recipe ideas ready. Farmers markets are great places to sell value-added products such as homemade barley-mushroom soup-starters, spaghetti sauces, or powdered mushroom blends. Once you are established in your local farmers market you can decide whether or not to target local restaurants or specialty grocery stores. These markets are based on demand and you will have to be able to commit to producing the amount of mushrooms they need. As more restaurants are realizing the benefit of offering their customers locally grown food, they are more willing to work with small farmers who offer quality products. Whether you grow mushrooms for your personal use or find a place to market your mushrooms, they are a great product for the homestead. The process is interesting, fun, inexpensive, and quick. You can start small and grow as big as you feel comfortable. The result of your work is beneficial to the health of your body, soil, and potentially, your pocketbook. What more could a homesteader want?